40 years ago this spring and summer – youth all around the world stood up and protested in a way that surprised many people in power. Students in Paris New York and all across Latin America, Europe and Asia. For today I want to write about the Columbia University protests. Which meant that a very white school in a mostly Black neighborhood meant segregation. people could not vote until 21 yo but knew that they would likely have to go to Viet Nam upon graduation. The OXFAM Japan international volunteers did a presentation last night that was excellent. Their energy and positive-ness was infectious. They did a good overview of Oxfam and the trailwalker event in May. It was great to see such a diverse and energized group interested in doing something to change the poverty in the world. Doing a party with many different groups has been a good learing experience. Why not just spend the time doing my own party? One of the goals is collaboration – getting groups to work together. I could do a sarajean party but I have no interest in doing that. I was to get groups together to work together for some community groups in need. This has been in mind for a while – I just do not have the confidence to start it. 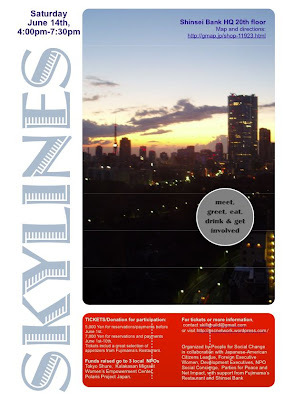 Join theEarth Day events in Yoyogi Party all day all weekend! I keep doing this workshop once a year to prove to my self that understand the concepts and convey what it is to others in a way so that they may utilize them. This was the most difficult one I ever did and it will be the last one I do at Temple. Why tough? Only 3 people and 2 people who just wanted to study English. And that was 10-5pm. I have done this one other time this was but this was not an interactive group nor was it an imaginative trio. Maybe creating a new workshop on social mobilization. Or maybe I just need to join a class my self! Find out about the real training program at the Midwest Academy. Saturday April 12, to Friday April 25, 2008. - to celebrate 60 years since the signing of the Universal Declaration of Human Rights (UDHR) in 1948, and the launch of a new campaigning group in Tokyo, AITEN. Location: Ben's Café in Takadanobaba, Tokyo. PSC will be holding our monthly networking event there on Friday April 25. Why is corporate outreach so hard? I am asked this a lot – most will blame the nonprofit ngo staff for meting lousy at pr and marketing. I do not deny the lack of people with skill and experience in this area however there is a certain level of condescension. Then there is just a lack of understanding in general that this is a profession. This is a career not a hobby. But that applies not just to people in the nonprofit NGO sector but also consultants – who do you work for? That question is only hard to answer because there is an expectation that if you do not work for a large and famous org then you are pursuing a hobby. Let me share a personal story. I went to a CSR event in March where I met many people from many companies. Among the people I met was a person from a certain well-known American apparel company who contacted me shortly after the event. I was asked to meet.